Siraj Ibn Wahhaj and one of his devout wives were charged with abuse of a child resulting in the death of a child and conspiracy to commit abuse of a child. Law enforcement rushed to destroy the Islamic compound just days after the kidnapping and murder made national news. They destroyed evidence, despite the fact that the investigation was new and ongoing. New charges were filed against the devout (“extremist)” Muslims. For years, the FBI and local law enforcement did nothing about this jihad compound, despite tips and numerous calls from concerned citizens. It took the murder of a child to get them to pay attention. What is the first thing they do after it is discovered a child was murdered on the compound and several starved to almost certain death? They destroyed the compound to cover up both their negligence and what happened there. News of what happened there was embarrassing to the Muslim community in the U.S., and making Islam look good seems to be the top priority of law enforcement officials. It’s sharia compliance in New Mexico. Before the Islamic compound was destroyed. After the Islamic compound was destroyed. Authorities in New Mexico announced new charges Friday against two adults previously arrested at a compound linked to “extremist Muslims” regarding the death of a missing 3-year-old boy. 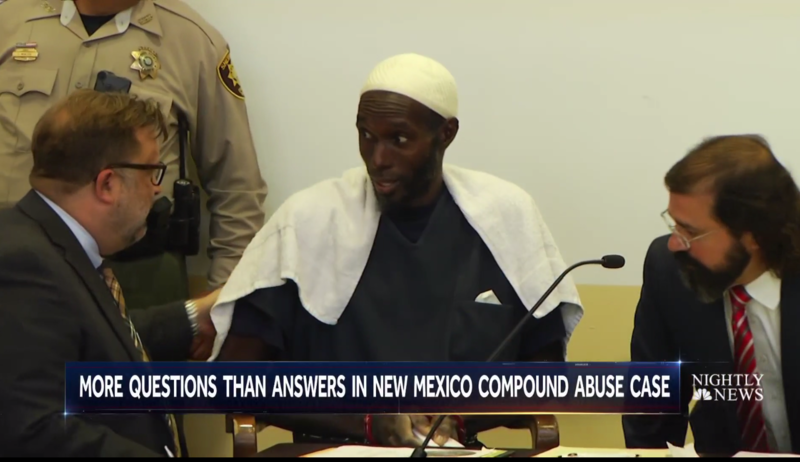 Siraj Ibn Wahhaj, the boy’s father, and Jany Leveille were charged with abuse of a child resulting in the death of a child and conspiracy to commit abuse of a child, Taos County Sheriff Jerry Hogrefe said in a Friday news release. The new allegations come after health officials last week revealed a child’s remains that had been located at the compound were positively identified by the Office of the Medical Investigator as Abdul-Ghani Wahhaj, the defendant’s son. Leveille, who earlier this month was transferred to the custody of U.S. Citizenship and Immigration Services (USCIS), was returned Thursday to the custody of Taos County, “where she is still being held on Federal immigration charges, as well as state charges for eleven counts of child abuse,” authorities said. The boy went missing in December in Jonesboro, Georgia. His mother reportedly told authorities he went missing after his father took him to a park in Clayton County and didn’t return for several days. Authorities discovered the child’s body on Aug. 6, days after a raid at the compound, located near the Colorado state border. Taos County Sheriff’s deputies discovered 11 children, who were taken into the custody of state child-welfare workers. Five adults were arrested in total, including Siraj Ibn Wahhaj and Leveille. During a court hearing this month, prosecutors said the children were trained to use firearms and were taught tactical skills in order to kill teachers, law enforcement and other institutions they deemed corrupt.